Vinyl prominently displayed in the new Dumb Records location. Music streaming (both subscription-based and ad-supported) accounted for 75% of music revenue during 2018.With this increase in music streaming, physical albums sales have experienced a sharp decline during this period. Physical as well as digital album sales now account for less than 20% of album sales with track sales accounting for 6% of music revenue. During this decline we have witnessed a surprising increase in one area. That would be the sale of vinyl records. For 13 consecutive years, vinyl sales have experienced a increase in sales. In 2018, 16.7 million LP’s (Vinyl Records) were sold in the US accounting for a near 15% increase in sales from the previous year. What could be the explanation for this surprising resurgence in the 2019? I was able to speak with the owners of several record stores in Springfield, IL (given that 67% of vinyl sales take place in physical stores) and listened to their opinions on why this may be. 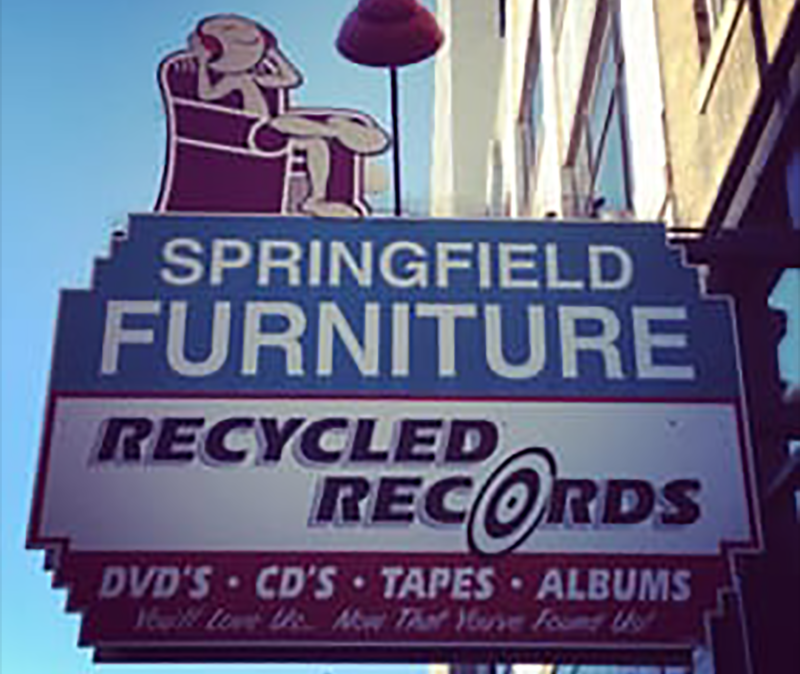 Recycled Records sign in downtown Springfield, Illinois. In 2019, we have more options than ever for consuming music. So why have millennials have decided to go back in time and purchase vinyl releases. Some individuals claim that vinyl provides better sound quality. Mark Kessler (the owner of Recycled Records) said that vinyl produces a “warmer” sound than other formats of music. When an individual uses the term “warm” when referring to music, they are referring to the bass which has a slightly unique sound when pressed into vinyl. 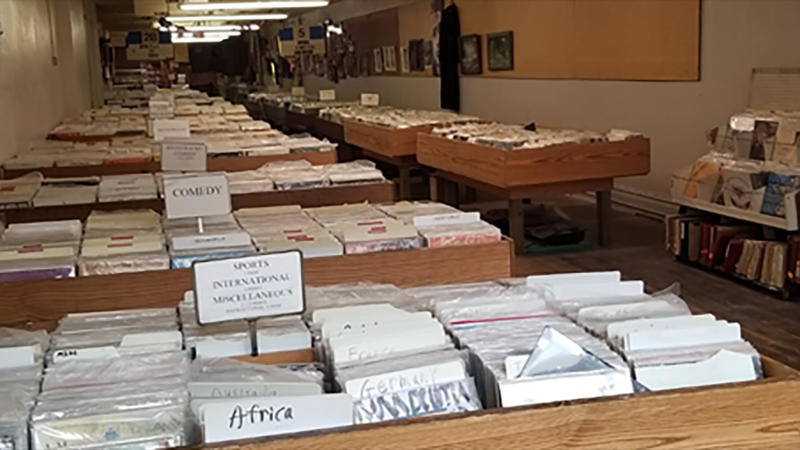 Mark has been the owner of Recycled Records for over 40 years in over that time the store has accumulated over 30,000 records in their inventory. More people have been going upstairs at Recycled Records in Springfield lately to mine the vinyl. The vinyl is a little harder to find downstairs at Recycled Records. Brian Galecki, owner of Dumb Records. Music often feels more real when you can physically hold it in your hands. Brian Galecki (current owner of Dumb Records) “There is a lot of value to being able to physically hold music.” Vinyl does a better job of catching your eye than CD’s. CD’s are often compared to plastic office supplies due to their dull appearance. The visual appeal isn’t there as opposed vinyl. Springfield is in a unique location regarding the vinyl industry. After speaking with John Michael Combs (the owner of The Elf Shelf Books & Music), I learned that Springfield was very close to Capitol Records Pressing Plant - (Jacksonville, IL) and Columbia Records Pressing Plant (Terre Haute, IN) (two of the largest pressing plants in the nation) before they were closed. Springfield saw a large influx of records because these plants were so stocked with inventory. I was told that they would even give away some of the inventory to their employees when it became too much. The Elf Shelf has certainly been a beneficiary of Springfield's location as all of it’s inventory consist of used LP's. John told me stories about how he has had customers come all the way from Dekalb, IL to look at what he has in stock. 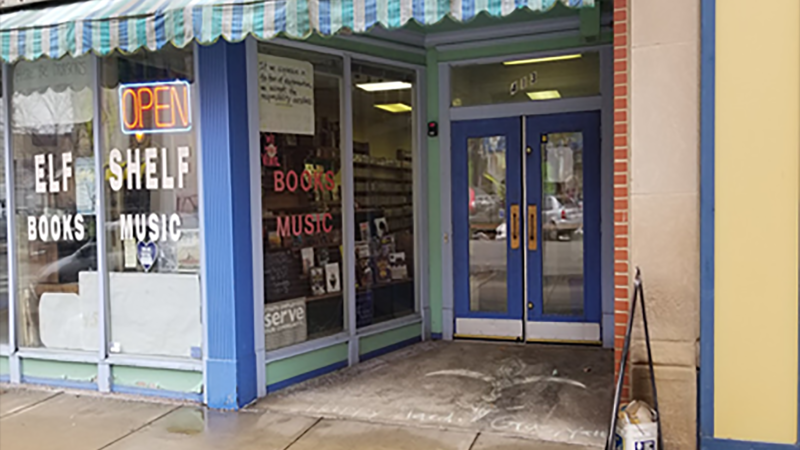 The store has been open for over 30 years and has been able to enjoy 2 separate locations in Springfield before permanently settling at its current location downtown. Although ownership has shifted hands a couple of times, The Elf Shelf has always been able to maintain a healthy business. John has been the store's owner for 4 years and he says that he does not see himself selling the shop or its inventory anytime soon. The entrance to Elf Shelf. 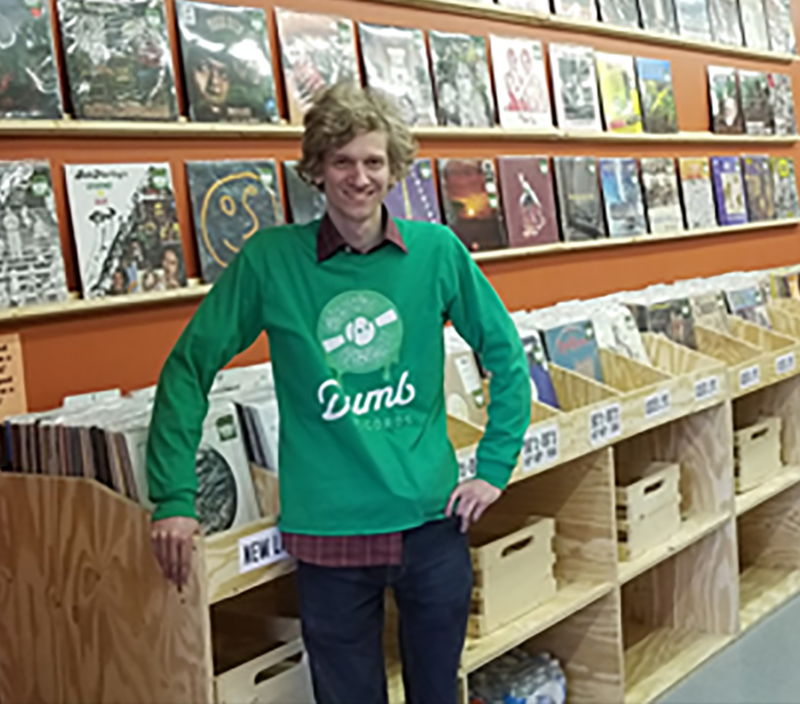 Dumb Records is another example of how Springfield's location along with the increase in vinyl sales has benefited small business owners. Dumb Records has evolved from the Black Sheep Cafe which is an all ages music venue in Springfield Illinois that was started in 2005. In the early stages, it was entirely volunteer ran. The Black Sheep Cafe hosted local artists along with many touring bands as well. 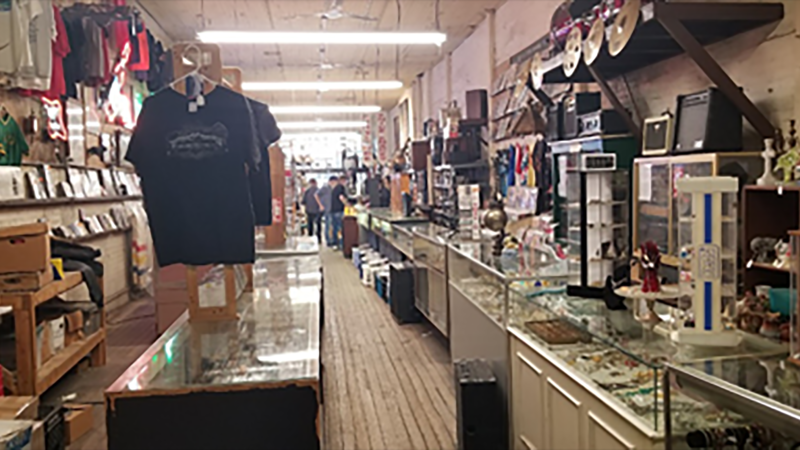 Eventually, the Black Sheep expanded into the sale of merchandise and in 2014 Dumb Records was officially opened next door by current owner Brian Galecki. Over time, the shop has expanded it hours from being open 3 days a week to 7 days a week. The store has also recently moved to a new location in downtown Springfield in hopes of gaining more traffic. It is safe to say that they have experienced success and are aiming for more. A trip to a record store can be an experience within itself. There is a chance you can come across a rare piece of vinyl dads may not be easy to find in other locations. During my trip to Dumb Records, I came a promotional copy of Pablo Cruise, A Place in the Sun for $1. For those who may not be familiar with promotional copies this means that this release was only given to radio DJ’s for usage on the radio and not for resale. So next time you visit your local record store, I advise that you take a longer look at the items you are grabbing. You may discover more value upon a second look. Brandon Smith is the Civic Education Coordinator Graduate Assistant at NPR Illinois. Besides a love of music, he works on the Roster of State Government Officials and other projects.